Emerson's Fisher Cavitrol Hex trim severe service valve option reduces or eliminates vibration. Emerson has announced that its Fisher Vee-Ball rotary control valves are now available with Cavitrol Hex anti-cavitation trim to reduce or eliminate vibration caused by cavitation. The company says the Cavitrol Hex trim severe service valve trim option reduces or eliminates vibration and improves plant availability and safety. Cavitation is the formation and collapse of vapour bubbles (cavities) in liquid flow streams caused by changes in pressure and velocity. The three main negative side-effects of uncontrolled cavitation in control valves are excessive vibration, equipment damage and deterioration of flow control. Vibration damages equipment and as it deteriorates, flow can’t be controlled properly, impacting plant availability and output. Left unchecked, excessive vibration can create unsafe working conditions. The Cavitrol Hex Anti-Cavitation Trim substantially decreases vibration and reduces or eliminates cavitation to improve plant safety. 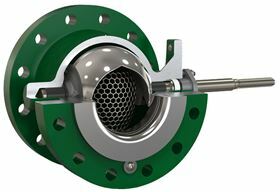 Cavitrol Hex trim is available on Fisher V150, V200 and V300 rotary control valves. It can be retrofitted into previously installed Vee-Ball valves after minimal modifications to the valve body. The trim option is available on Vee-Ball valves in sizes NPS 4 through to 12, providing high capacity for gas, steam and liquids. Ensures uninterrupted plant operation during flooding. Pentair plc has reached an agreement to sell its Valves & Controls business to Emerson in a US$3.15 billion deal. Emerson Process Management has extended its Fisher Vee-Ball family to include the V150E version with expanded outlets.